I don't want to write this story, there are several reasons; the first reason is that I am truly concerned for my safety. Secondly, this is a sad story and though the killers involved should know better, their training and the support for their actions by the Force indicate that they were doing what they were trained to do and that appears to be kill people. The last reason I don't want to tell this story is that little or nothing is, or will be, done about the situation where the police in Canada have reintroduced capital punishment and no sanctions are taken against any officier for killing people even the case in B.C. were a prison in handcuffs was shot and killed because the officer involved "feared for his life." Some eight Saskatchewan people in the last year or two have been shot and killed by police, it has become common place on reserves and all of the officers involved were male and all were cleared of wrong doing. Yesterday Edwin Wallace referred the out of control police as the KKK (Kanada's Killer Kops), I don't share Edwin's opinion on gun legislation because I think no one should have fire arms and that includes the police, who are themselves, poorly trained in the use of weapons. Just to clear that matter up, the training a policeman receives does not qualify him to use a hunting rifle to go hunting, for that, he needs to take a fire arms safety course. The most amazing thing about police and weapons is the use of the Taser, which to a Mountie, is considered a non-lethal weapon, yet these things are banned in Canada and can not be purchased by civilians. Close to thirty Canadians have been electrocuted with these things, most of them people with mental illhess, drunk, or in at least one case in a diabetic stupor. They are instructed to use it once on a victim, but Mounties and other police seem to get off on seeing the enormous pain it causes in the victim and do it over and over. 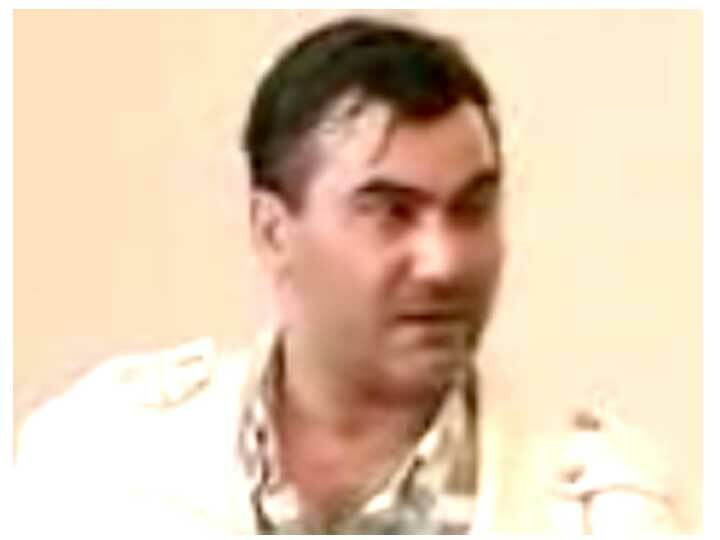 In Dziekanski's case he was electrocuted five times causing death. 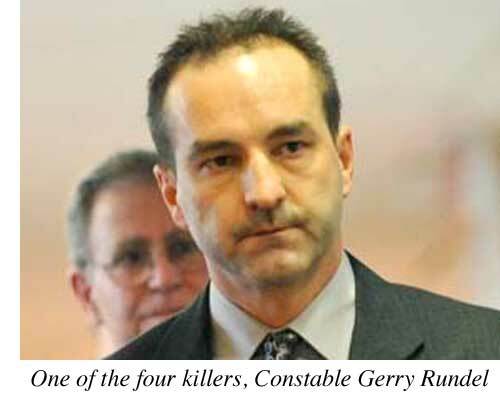 Even while he was struggle with the pain from the jolts, three of the four killer Mounties were on top of him and of course he stopped breathing. If that wasn't enough, when the first responders arrived, they would not allow the dead body to have the hand cuffs removed. The reason mounties give, and in their training it is considered legitimate to kill someone if the officer "fears for his life." Apparently female Mounties do not fear for their lives as I do not recall any Canadian female officer being involved in killing a suspect or prisoner. Since the pen is said to be mightier than the sword, surely a computer must be even more dangerous and this story might make some officer fear for his life and my life is in danger. Not only that, I own two staplers, which according to their statements at the Vancouver hearings, the victim had one in his hand, causing the officer to fear for his life. As of now sports fans, a stapler is considered a lethal weapon. Sadly, what have we learned from the Dziekanski case and subsequent hearing? Raising one's hands above your head as Dziekanski did when the police arrived, does not mean you are surrendering. If you are upset from being confined for ten hours in an airport holding area, you have 25 seconds to live after police arrive. Four mounties feared for their lives when a man held a stapler in his hand, although no stapler was recorded in the video of the incident. The most important lesson is to conside, what you would do if in Warsaw's airport with no English speaking people to help you for ten hours, if you were not upset, there would be something wrong with you, and if you are upset, would the police kill you? I know that many people who read this will strongly object to what I am saying as they know good policemen and Mounties who they do not consider killers. What we must understand thoroughly about this issue is that the Royal Canadian Mounted Police are a military police force. Each member of the force acts in accordance with the extremely rigid training and condition which undergoes and as such will most surely act the same as those officers who kill people. Look at the face of Gerry Rundel (right) he is a killer, with three other officers he assisted in ending the life of an unarmed man, they acted swiftly, 25 seconds after coming on the scene, they electrocuted the man repeatedly and can be seen wrestling with him in his oncontrollable agony in the video shot by Paul Pritchard (from which the top two pictures on this page were lifted). Does he look like a killer? No more and no less than the Mounties you know and perhaps love. But all Mounties have received the same training and all, given similar circumstances, are programmed to use deadly force. If you are accosted by one and have anything in your hands that might resemble anything that might be a weapon, a knife, a stapler, whatever and that officer decides that he is frightened, he will kill you knowing full well he will have immunity for his action. Just so you understand, when asked at the inquiry, if he wanted to appologise to the greiving mother of the deceased, Rundel refused to do so. In his mind and the minds of his fellow killers at that murder, he believes he did the right thing and has a load of reasons, most to silly to state, for their action. The head of "E" Division and its investigation into the matter agree with them and so all Mounties across this country are responsible, equally. 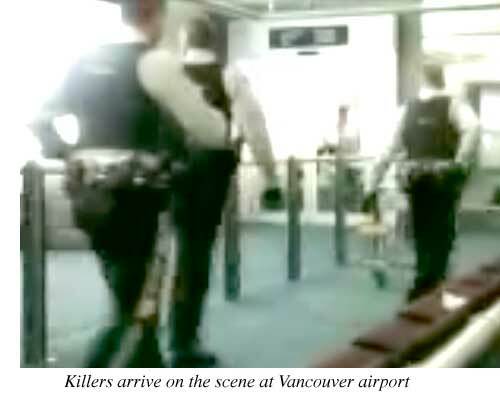 You will notice I used the term murder to describe what the four officers did a year ago in the Vancouver International Airport. They had already decided before arriving, that's premeditation, that they were going to Taser the victim. You can see that in the video because they move deliberately to him, he raises his hands in surrender and they hit him with the Taser. The sequence is immediates, without thought or consultation with each other. They went into action with a lethal weapon intent to kill the man and that is the definition of murder. I have known many Mounties in my life, one was indeed the best friend I have ever had, and I never felt uncomfortable around him, even when he walked behind me, but I know what he was capable of and in any circumstance that would trigger his training, he would act with dispatch. Is there a solution to killer cops? Definitely there is. Better, more costly training, much more careful screening of candidates and above all, the de-militarisation of Canada's national police force.